Chennai (also known as, formerly Madras ) is the capital city of the Indian state of Tamil Nadu. Located on the Coromandel Coast off the Bay of Bengal, it is the biggest industrial and commercial centre in South India, and a major cultural, economic and educational centre. Chennai is known as the "Detroit of India" for its automobile industry. Chennai is the sixth-largest city and fourth-most populous metropolitan area in the country and 31st-largest urban area in the world. The city is host to the third-largest expatriate population in India after Mumbai and Delhi, with 35,000 in 2009 and steadily climbing to 82,790 in 2011. Chennai is the only city in South Asia and India to figure in the "52 places to go around the world" by The New York Times. Tourism guide publisher Lonely Planet has named Chennai as one of the top ten cities in the world to visit in 2015. Chennai is ranked as a beta-level city in the Global Cities Index ahead of Hyderabad and Kolkata Chennai has also been named in the hottest cities to live in for 2015 by BBC among global cities with a mixture of both modern and traditional values. The Portuguese first arrived in 1522 and built a port called Sao Tome after the Christian apostle, St. Thomas, who is believed to have preached in the area between 52 and 70 CE. In 1612, the Dutch established themselves near Pulicat, north of Chennai. On 22 August 1639, which is referred to as Madras Day, the British East India Company under Francis Day bought a small strip of land stretching 3 miles on the Coromandel Coast. They got a license to build a fort and a castle in the contracted region. The ruler Damarla Chennappa Nayakudu, the Nayaka of Vandavasi, granted the British permission to build a factory and warehouse for their trading enterprises. The region was then primarily a fishing village known as "Madraspatnam". A year later, the British built Fort St. George, the first major British settlement in India, which became the nucleus of the growing colonial city and urban Chennai, grew around this Fort. Post independence the fort housed the Tamil Nadu Assembly until the new Secretariat building was opened in 2010. But shortly afterwards it was again moved back to Fort St. George, due to a change in the Government. 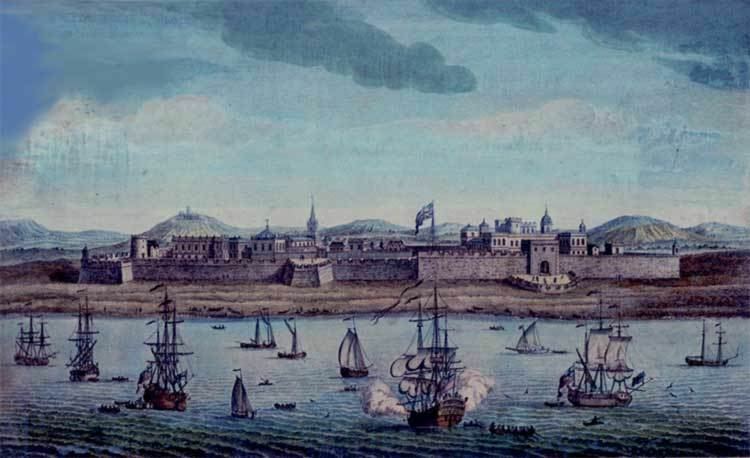 In 1746, Fort St. George and Madras were captured by the French under General La Bourdonnais, the Governor of Mauritius, who plundered the town and its outlying villages. The British regained control in 1749 through the Treaty of Aix-la-Chapelle and strengthened the towns fortress wall to withstand further attacks from the French and Hyder Ali, the Sultan of Mysore. They resisted a French siege attempt in 1759 under the leadership of Eyre Coote. In 1769 the city was threatened by Mysore and the British were defeated by Hyder Ali, after which the Treaty of Madras ended the war. By the late 18th century, the British had conquered most of the region around Tamil Nadu and the northern modern–day states of Andhra Pradesh and Karnataka, establishing the Madras Presidency with Madras as the capital. The Chennai Metropolitan City which has an GDP of 219 billion and Chennai City(Chennai) has a GDP of 66 billion.It is fourth metropolitan area to produce $219 bn in India ahead of Bangalore Metropolitan Region and after Kolkata Metropolitan Region. Chennais economy has a broad industrial base in the automobile, computer, technology, hardware manufacturing and healthcare sectors. As of 2012, the city is Indias second largest exporter of information technology (IT) and business process outsourcing (BPO) services. A major part of Indias automobile industry is based in and around the city thus earning it the nickname "Detroit of India". It is known as the Cultural Capital of South India and is the most visited city in India by international tourists according to Euromonitor. The city also serves as the location of the Madras Stock Exchange and the secondary financial hub in India following Mumbai.